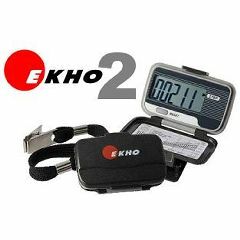 The Ekho TWO Pedometer tracks steps and multiplies them by your stride length to calculate the number of miles you traveled. easy to read and acturate. 60 year old female. semi active. I have had other monitors and they lasted a very short time. This one I wear every day and I am very please with it.